Many people who are beginning to realize that life is not what it’s cracked up to be are no longer willing to pay big bucks for graduation ceremonies. The Times recently ran a story on the “boom” in the cremation business, “In Tough Times, a Boom in Cremations as a Way to Save Money,” NYT, 12/8/11). And there are probably people who would just as soon toss their loved ones down the incinerator as pay for even a cremation. The only problem is that the average person who is finicky about the sight of blood is unlikely to feel comfortable acquiring saws, mallets and other tools which could aid in chopping a corpse into the kind of easily disposable pieces which would fit down the hallway hatch of a highrise. For some reason we are not OK with human abattoirs, unless we are trying to exterminate another race. If we only treated our loved ones the way we do those we hate and despise and have no feelings sending to the auto-da-fe then maybe we could save a buck it these perilous times. 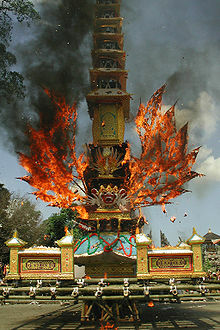 But back to the subject of plain old cremation. The Times reported that while cremation was “All but taboo in the United States 50 years ago, cremation is now chosen over burial in 41 per cent of American deaths, up from 15 percent in l985, according to the Cremation Association of North America.” Does the Cremation Association offer health and even life insurance policies to its members and is the plan open to crematees as well as cremators? If one reads the fine print of the Times piece one thing is certain: cremation is a good deal. In an anecdotal example one deceased person’s remains were cremated for $1600. The front page Times story went on to say that the price included "a death notice, a death certificate and an urn bought on line. It was a fraction of the $10,000 to $16,000 that is typically spent on a traditional funeral.” However caveat emptor, at current rates, the death notice is unlikely to appear on the obituary page of the Times.